"Exactly when and where the first white resident of Brooklyn made his appearance is not known. Most of the glimpses we have had of the forerunners of civilization upon the West Side, were caught down near the lake and about that part now known as Main and Detroit streets. There was, however, out near the present Riverside Cemetery, a grassy slope running up from the Cuyahoga River, which, even in late years, was known as "Granger’s Hill." Here came, from Canada, one Granger, who became a "squatter," but at what date is not certainly known. He was there when James FISH, in May, 1812, became the first permanent settler of the Brooklyn Township of the later days. The stay of the squatter, however, was not long, as he migrated, in 1815, to the Maumee country. James Fish came from Groton, Connecticut, having purchased land of Messrs. Lord and Barber. He left home, in the summer of 1811, with his family stored away in a wagon drawn by oxen. He was accompanied by quite a company of pioneers, and spent forty-seven days upon the road. He passed the winter in Newburg; early in the spring of 1812, he crossed over to Brooklyn, erected a log-house at a cost of eighteen dollars, and in May took his family over and commenced house-keeping. In the same year came Moses and Ebenezer FISH, the last named serving as one of the militiamen guarding the Indian murderer, whose execution in 1812 has been elsewhere recorded. In 1813, came Ozias BRAINARD, of Connecticut, with his family; while in 1814, six families arrived as settlers within one week—those of Isaac HINCKLEY, Asa BRAINARD, Elijah YOUNG, Stephen BRAINERD, Enos BRAINARD, and Warren BRAINARD, all of whom had been residents of Chatham, Middlesex county, Conn. They had all exchanged their farm lands at home for those placed upon the market in this section of the New West. Their journey and reception has been described thus—with what warrant of exact truth we are not prepared to say: "All set out on the same day. The train consisted of six wagons, drawn by ten horses and six oxen, and all journeyed together until Euclid was reached (forty days after leaving Chatham), where Isaac Hinckley and his family rested, leaving the others to push on to Brooklyn, whither he followed them within a week. " Brooklyn Township, the land west of the Cuyahoga River, was known as the Lord and Barber allotment. All settlers would have purchased their land from Samuel P. Lord and Josiah Barber. The first permanent white settler of Brooklyn was James Fish. 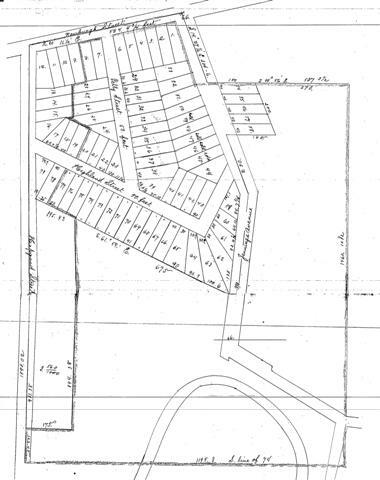 Brooklyn Centre consists of two of the main lots, #65 and #74, as surveyed and marked out for the Western Reserve. The early settlers of Brooklyn Centre were brothers, Ebenezer and Moses Fish on lot #65 and Ozias Brainard on lot #74. Prior to 1874, Ebenezer Foster purchased the area bounded by the Cuyahoga River on the East, Newburgh Street (Denison Ave.) on the South, and about West 16th on the West. His home was probably located in the vicinity of the north corner of what became Denison Ave. and West 14th. If you look at the image in the previous Phase description, you will see several other Fosters as property owners. All those north of Denison were Ebenezer's sons. Daniel C. Foster, who owned the property south of Denison, was his brother. The exact site of his home is uncertain, but it was probably roughly where Slabe's Shoe Store was at the corner of West 14th and old Denison Ave.
Ebenezer was a farmer but we don't know what sort of crops he raised. Since there were a multitude of stables in the area and a couple of glue factories, he may have grown hay and corn for the horses. Read Ebenezer's own words about his family, their migration into this area, the FISH family, and what life was like in the early part of the 19th century. By 1892, the Foster Family began to sub-divide their property with the construction of several streets. The first street developed was Gertie Street (later known as West 15th). 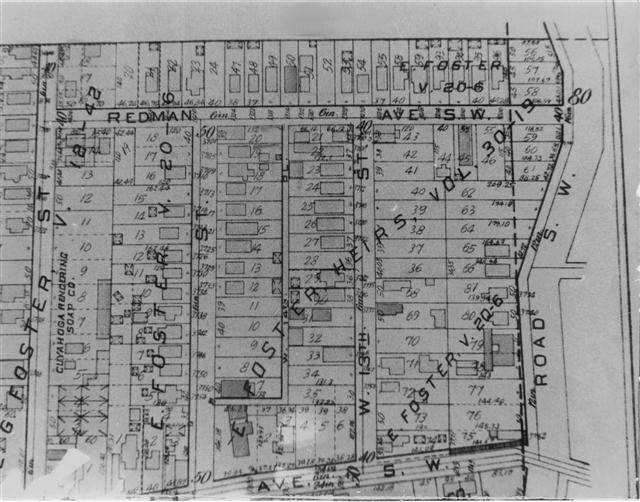 *Mohawk Street (named sometime between 1892 and 1897, later becoming known as Redman Avenue) ran along the northern boundary of the Foster properties. Foster Street ran parallel with Gertie and later became known as West 14th Street. Lookout Street (West 13th) appears by 1898 on a Real Estate Atlas of Cleveland. Just prior to the Harvard Viaduct Bridge being built in 1910 at 3,232 feet in length, the area around West 14th and Denison looked quite different from anything anyone living can recall. Denison Avenue was a straight shot right down to and past Jennings Avenue. Several houses stretched from the corner southwards. These were razed to make room for the approach to the Harvard-Denison Bridge. German immigrants were amongst the earliest residents of this newly developed neighborhood, but many only remained for a short time before moving on to other areas of the city. CLICK HERE for an Excel spreadsheet detailing property transfers (deeds) for the neighborhood. 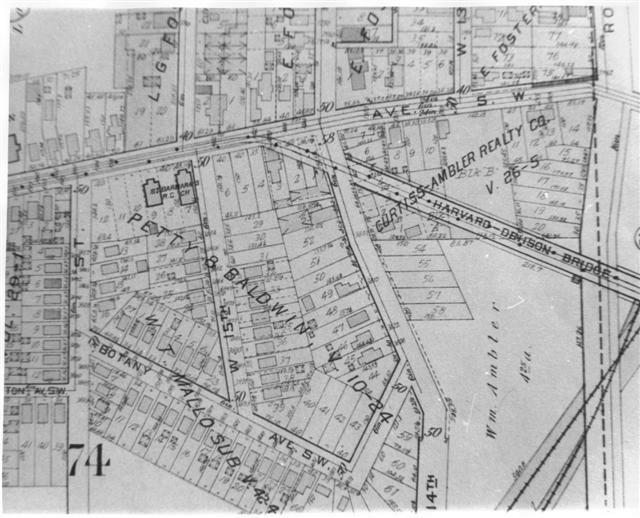 Area south of Newburgh Street (now Denison Ave. at the west end of the Harvard-Denison Bridge) Consolidate Oyster Packing Company obtained the large tract of land in 1889 and began development. No housing existed yet. Area north of Denison Ave. at the west end of Harvard-Denison Bridge. Covers Ebenezer Foster's property which has become developed with most lots now having houses on them. Area south of Denison Ave. at the west end of Harvard-Denison Bridge. This property was originally owned and developed by Daniel C. Foster. As Polish immigrants, working in the tanneries, steel mills, and other industries of the Cuyahoga River valley, sought housing, they turned to the area at the eastern end of Denison Avenue. In the early years of the 1900's, they organized a parish and built St. Barbara's Catholic Church at West 15th St. and Denison. In the early 1960's, word came down from the County that a proposed highway would bisect the neighborhood. This was bad news for the people who had bought their homes and planned to live the rest of their lives there. A study of deed transfers shows that a small number of speculators jumped in and bought some houses. They probably knew what sort of price the State of Ohio Dept. of Transporatation was paying for properties acquired for freeways and paid the frantic sellers a lower price, hoping to make a profit from the true value. On the flip side of the coin, the sellers may have wanted to move quickly instead of waiting for the slow wheels of government to move, so jumped at the chance to be out of their property. After all the property was bought up on the east side of W.15th, the west side of W.14th and the north side of Redman, bulldozers moved in to begin demolition. It was an odd sight to be able to see straight across from the houses that were left on the eastern portion over to the houses that were on the western side. This page was last modified 15:06, 5 December 2010.